Developed for bodyshops, their work providers and car owners and launched in 2001, ClaimWatch is the longest running, independently owned, vehicle repair tracking system in the UK. It uses web-based technology to simplify communication between all parties whilst greatly improving customer care. 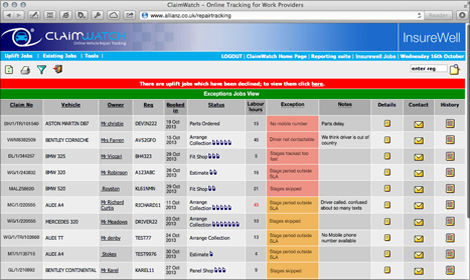 ClaimWatch enhances the driver's online experience, helps cut down repair update calls and at the same time up-sells services to the driver. It is best described as a front of house customer system, rather than a back of house bodyshop management system.